Caleb D. Sotelo, a third-year computer science and engineering student at the Jacobs School and part-time web developer for the Office of Research Affairs, recently earned the “Outstanding Contribution and Research Presentation” award at the SACNAS National Conference in Dallas. Thanks to the efforts of individuals in Academic Affairs, Research Affairs, Student Affairs, the Colleges, and University Communications and Publications, the long-awaited Undergraduate Research Portal is now online. It is meant to provide a single entry point to the myriad opportunities involving research available to undergraduates at UC San Diego. Check out the Undergraduate Research Portal's wealth of useful and informative features. If you had business near the Leichtag building on campus late last year, you might have noticed a gathering on the lawn above the Biomedical Library. Around tables, under awnings, or clustered in conversational groups in the sunlight, many of UCSD’s postdoctoral professionals enjoyed the first-ever Postdoc Appreciation Day. Faculty members and graduate students were also on hand to add their individual thanks. The appreciative pizza party alfresco reminded participants and passers-by alike of the significant contributions made by postdocs. Postdoctoral scholars are sometimes incorrectly characterized as students. “We’re not students,” one participant said. “We have graduated; we’ve earned our doctorates. We’re professionals – scientists, scholars, and researchers.” Others noted that about 1,000 postdocs are employed on campus – they represent a significant contributor to the research enterprise. Jennifer Oh, director of the Postdoctoral and Visiting Scholars Office in Research Affairs, noted that,“Postdocs here at UCSD and elsewhere constitute a major portion of academic researchers, particularly in medicine and the life sciences. They start new projects, test new hypotheses, and broaden the perspectives of their laboratories.” The postdoc experience, she says, is a kind of high-level preparation for very exciting and challenging positions in academia, government, the health fields, and the private sector. According to Hady Felfly, a postdoc in the department of pediatrics and chair of UCSD’s Postdoctoral Association, beyond the expected research and academic duties, he and his colleagues also make important contributions to the scholarly literature, and help write numerous grant applications. The work of campus scholars will be easier in 2010 thanks to new services and tools offered by Research Affairs. The new Research Proposal Development Service (RPDS) provides full-scale assistance to principal investigators (PIs) and their teams as they prepare large, interdisciplinary proposals. Smaller proposals benefit from proposal-preparation advice and sample text that can be adapted as needed. In addition, a new web-based reporting system, the Training Grant Administration System (TGAS), makes it easier to apply for and receive NIH training grants. The system lets users create data tables required for five-year training grant renewals. Users enter the required data and/or import available data on students, staff, faculty, graduate programs, academic departments, and contract & grant activity from existing databases. These new resources complement other resources, services and tools provided by Research Affairs to boost UC San Diego’s billion-dollar research enterprise. This newsletter will help keep you informed about these and other research developments as the year progresses. We are pleased to announce the new Research Proposal Development Service (RPDS) to assist PIs in the preparation of large, interdisciplinary proposals. Assist with coordination among proposal contributors. Provide guidance on the preparation of required proposal components pertaining, for example, to research compliance, dissemination of results, and enhancement of diversity. Please visit the RPDS website at http://rapids.ucsd.edu/ for more information on services offered, eligibility for these services, instructions for submitting requests for assistance, and the process by which requests will be prioritized. For additional information, please contact Associate Vice Chancellor for Research Initiatives Paul Yu (pyu@ucsd.edu; x4-3539) or Director of RPDS Sharon Franks (sfranks@ucsd.edu; x2-3452). Thanks to the efforts of faculty, researchers, students and staff, UC San Diego has now received more than $107 million in American Recovery and Reinvestment Act (ARRA) funds, with numerous proposals for additional support still being evaluated. Channeled through existing federal agencies such as the National Institutes of Health, the National Science Foundation, and the Department of Energy, the ARRA funds support research in medicine, biology, chemistry, oceanography, engineering and other fields – research that UC San Diego is noted for translating into innovations, medical breakthroughs, jobs and new businesses in San Diego and California. The Research Affairs IT team is pleased to announce the creation of a web-based reporting system that facilitates the process of applying for and receiving NIH training grants. The new Training Grant Administration System (TGAS) enables users to create the data tables required by NIH when PIs apply for five-year training grant renewals. TGAS users can enter the data required by NIH and/or import available data on students, staff, faculty, graduate programs, academic departments, and contract & grant activity from existing databases or from other TGAS reports. The data tables can then be exported into Excel for submission to NIH. This system was developed by several units on campus, including the Office of Research Affairs, the School of Medicine Dean’s Office, the Office of Graduate Studies, and the Office of Contract and Grant Administration. To get started, or for more information, visit the TGAS website or contact the Office of Research Affairs at 858-534-9758 or tgashelp-l@ucsd.edu. Thanks to a grant of $8,950,590 provided through the American Recovery and Reinvestment Act (ARRA), researchers at UC San Diego looking for the biological basis of differences in human behavior will use sophisticated gene-mapping tools and imaging technology to collect a wealth of data about brain development in children. The project will be coordinated within the university’s Center for Human Development (CHD), and the advanced neuroimaging work of the project will be based in the MultiModal Imaging Laboratory. Faculty from at least seven different UC San Diego departments will participate in the project, a testament to the growth and importance of interdisciplinary research, according to Vice Chancellor for Research Arthur B. Ellis. UC San Diego professors Terry Jernigan and Anders Dale are the project’s leaders. Read the original news release about CHD research. The San Diego Supercomputer Center (SDSC) has been awarded a five-year, $20 million grant from the National Science Foundation to build and operate a powerful supercomputer dedicated to solving critical science and societal problems by managing the overwhelming avalanche of data generated by the digital devices of our era. Among other features, this unique and innovative supercomputer will employ a vast amount of flash memory to help speed solutions that are now constrained by slower spinning disk technology. Also, new “supernodes” will exploit virtual shared-memory software to create large shared-memory systems that reduce solution times and yield results for applications that now tax even the most advanced supercomputers. Called “Gordon,” SDSC’s latest supercomputer will become a key part of a network of next-generation high-performance computers being made available to the research community through an open-access national grid. 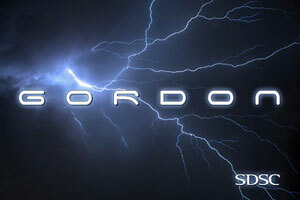 Gordon is the follow-on to SDSC’s previously announced Dash system, the first supercomputer to use flash devices. Notably, Dash earned first place in the SC09 Data Challenge. UC San Diego is among the nation’s leaders in encouraging and supporting interdisciplinary research. The university’s Organized Research Units (ORUs) demonstrate both the necessity for, and the wisdom of, bringing together experts from an array of fields to study complex processes, create new forms of expression, and solve daunting problems. One of the newest ORUs, the Center for Chronobiology (CCB), serves as an excellent example of that successful blending of knowledge and perspectives across disciplines, and it has an ambitious goal: to establish UCSD as the premier international center of chronobiology research. The list of scientific and academic specialties represented in the CCB shows just how intertwined most modern research has become: psychology, biology, physics, psychiatry, pharmacy, bioengineering, philosophy and reproductive medicine – with sub-specialties within each of those fields. Molecular clock mechanisms and gene-protein networks – employing genetic techniques as a way of dissecting complex biological phenomena. Oscillator networks – studying the “master mammalian circadian pacemaker” found in nuclei of the hypothalamus. Metabolism and physiology – discovering the relationship between circadian rhythmicity and physiological organization in multi-cellular organisms. Sleep and behavior – understanding the relationship between daily rhythmicity and higher-order mental and cognitive functions. They fully expect, however, that the center “will evolve in novel directions,” and that CCB researchers will make connections outside of these formal clusters. The members of the new ORU clearly understand that informing their peers and educating the public are vital to the long-term success of the center. Accordingly, they will work through their departments to implement a new graduate course in chronobiology; start a new journal club (to complement the existing Mammalian Chronobiology Journal Club); organize a yearly lecture series; and maintain an active website for both internal and external audiences. The CCB recently co-sponsored its first symposium, a discussion of circadian rhythms held at the Salk Institute. Chronobiology, says Brody, has been associated with La Jolla even before there was a UCSD. He cites two Scripps Institution of Oceanography scientists, B. Sweeney and W. Hastings, who studied the marine organisms responsible for luminescent waves in the 1950s, and mentions both Bob Moore, a member of the School of Medicine, and Warren Butler, a biologist, both of whom explored, in different ways, the rhythms of life. Brody himself organized and hosted a National Science Foundation conference in 1976 that drew scientists from around the globe. With a solid foundation in the university’s past, a strong presence in the interdisciplinary present, and the promise of collaborative achievements in the future, the chronobiologists of the CCB are clearly rising in the tidal rhythms of science.